When we’re discussing a soundproofing issue with a customer, we generally spend quite a bit of time describing the phenomenon of flanking sound. This is at the heart of solving many noise problems. So what exactly is Flanking Noise? Let’s imagine for a moment that you have a wave of water approaching your house. You run outside and install a sandbag wall that is exactly as wide as your property. No water should get through that wall. Next thing you notice that you are up your ankles in floodwater. Why? Because the water simply went around your wall. The water flanked your wall. This is similar to what might be experienced in a soundproofing strategy. Suppose you share a common wall with a neighbor and he keeps you up at all hours. Perhaps you have an upstairs neighbor that sharpens his bowling skills after midnight. Let’s further suppose that you install 12” of lead on that wall or that ceiling. That should solve the problem, eh? If you think of our floodwater analogy, it might not come as a surprise that you may continue to hear that noisy neighbor even after a soundproofing treatment. Like our floodwater, some of the sound simply flanked around the 12” of imaginary lead. Sound will move from one room to another through both direct and indirect paths. Some amount of energy will travel through or around a wall or ceiling. the wall or just the ceiling at all. Well while every structure is different, treating only the one main “direct” pathway will most often prove satisfactory for most people. This tactic generally reduces the sound to a tolerable level, but will usually not eliminate 100% of it. It is important to understand that while sound can travel through air pockets like ductwork, stud and ceiling joist cavities, it can also be conducted along studs, joists, pipes, concrete and glass. Like your voice on a string between two orange juice cans. The string is a conductor just like a stud or joist. A common myth is that if you don’t treat every surface, all of your soundproofing efforts will have been in vain. This is simply not the case at all. If you significantly reduce the sound passing through the one main wall, for example, that’s great. What remains will likely be flanking noise coming through side walls, the floor or some other untreated surface. Through the floor framing system under the wall. In some construction there is a joist system that travels under the offending wall. The floor systems on either side of the wall is connected, so while there is no open air path from his side to yours, the floor framing itself can conduct the vibration from his side to yours. This may or may not be a significant flanking pathway. Through the ceiling joist system. There are times when an attic area is common to both rooms. 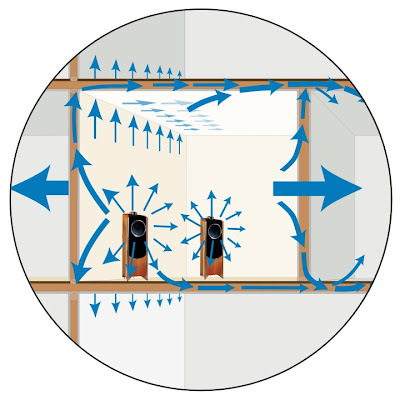 Vibration from the offending room are transmitted via airborne path or conducted through the joists themselves. Through side walls. Walls in your unit are usually directly connected to the next door unit. Through the Ductwork. How many times have you been able to listen to a conversation going on in another room by sticking your ear by the air vent? Standard ductwork is metal, and therefore very conductive. Ductwork has smooth, hard surfaces and can therefore bounce sound inside from one room to another. Try lining the rigid ducts with a 1” compressed duct liner, generally available through any Heating & Air Conditioning distributor. Doors. Whether residential or commercial, most doors are poor isolators of airborne sound. Two main reasons for the poor performance. Poor seals and lack of mass. Try a heavy exterior door. It has mass and weatherstrip to seal it up. Seal up the holes. Outlets and gaps are all holes that can transmit sound, especially high frequencies. Use a caulk where the drywall meets the floor behind the base molding. Seal the outside surface of the outlet box with a heavy putty pad or use a plastic electrical box designed for use in vapor barriers (they’re sealed). By considering the less obvious pathways that sound can travel, you will have a better ability to stop it. If the situation becomes too much to deal with, you could consider contacting a professional Acoustical Consultant.